Tight junctions create a paracellular barrier in epithelial and endothelial cells protecting them from the external environment. Two different classes of integral membrane proteins constitute the tight junction strands in epithelial cells and endothelial cells, occludin and members of the claudin protein family. In addition, cytoplasmic scaffolding molecules associated with these junctions regulate diverse physiological processes like proliferation, cell polarity and regulated diffusion. In many diseases, disruption of this regulated barrier occurs. This review will briefly describe the molecular composition of the tight junctions and then present evidence of the link between tight junction dysfunction and disease. Tight junctions (TJ) (zonulae occludentes) form a continuous, circumferential, beltlike structure at the boundary between the apical and the basolateral membrane domains in epithelial and endothelial cells. By constituting a regulated diffusion barrier for the paracellular pathway, TJs establish separate compartments in multicellular organisms and are also crucial for the exchange of substances between the internal and external cellular environment by the expression of tissue-specific transport proteins and channels. The transmembrane proteins constituting the TJs are attached to the cytoskeleton, thereby linking cell–cell and cell–substratum adhesion sites. In addition, cytoplasmic plaque proteins constitute scaffolds for TJ assembly or are involved in the regulation of processes like transcription, proliferation and differentiation into a tissue-specific regulated diffusion barrier in physiology and development. Many excellent reviews have summarised data regarding the molecular composition and function of TJs (Ebnet 2008; Gonzalez-Mariscal et al. 2003; Matter and Balda 2003a; Mitic and Anderson 1998; Schneeberger and Lynch 2004; Tsukita and Furuse 1999; Zahraoui et al. 2000), so that the scope of the current review is focused on disturbances of TJ function in human diseases. As the apicalmost part of the junctional complex (Farquhar and Palade 1963), the TJ forms a continuous, circumferential belt separating apical and basolateral plasma membrane domains, working as a barrier within the intercellular space and as a fence within the plasma membrane. In recent years, information on the molecular composition of TJs, in particular their transmembrane molecules, has accumulated, forming the basis of our current understanding of the structure and function of TJs in molecular terms (Fig. 1). The morphology of TJs has been intensively analysed by freeze–fracture electron microscopy (Staehelin 1973; Wolburg et al. 2003), where they appear as a set of continuous, anastomosing transmembraneous particle strands on the inner leaflet of the plasma membrane (P-face) with complementary vacant grooves on the outer leaflet (E-face) (Fig. 2). The number and complexity of ramification of the network of TJ strands depends on the cell type, in sum yielding differences in permeability barrier function between different tissues (Staehelin 1973). However, since a direct linear relationship between the complexity of the TJ strand network and the measured transepithelial electrical resistance (TER) could not unambiguousy be established for all cell types analysed, it was predicted that the strands might contain pores that fluctuate between open and closed conformations, suggesting that the TJ strands appear to be remarkably dynamic (Claude 1978). Recent identification of the TJ-specific integral membrane proteins forwarded our understanding of TJ molecular composition in mammals: occludin (ca. 60 kDa) was identified as the first integral membrane protein localised at TJs in chicken (Furuse et al. 1993) and then also in mammals (Ando-Akatsuka et al. 1996). The occludin transmembrane domain spans the membrane four times with a short cytoplasmic N-terminus and an especially long corboxy-terminal cytoplasmic domain (Fig. 3a). Occludin localizes to the TJs, and its overexpression increases TER in mammalian epithelial cells (Balda et al. 1996). However, transfection of insect cells devoid of endogenous TJs with occludin cDNA surprisingly demonstrated that occludin is not by itself sufficient to form TJ strands but its expression merely produced focal homophilic adhesion sites (Furuse et al. 1996). Moreover, disruption of both occludin alleles in embryonic stem cells did not prevent the formation of an effective diffusion barrier and the polarisation of epithelial cells, as shown by freeze–fracture analysis and TER assessment (Saitou et al. 1998). It was thus concluded that occludin is not required for the formation of TJ strands. However, occludin appears to interact, directly or indirectly, with claudins and is recruited into the long strands formed by coexpression of claudin-1 and claudin-2 (Furuse et al. 1998b, 1999). Balda et al. (1996) however reported that overexpression of both, wild type and COOH-terminally truncated occludin overexpression in cultured MDCK epithelial cells induces not only a modest increase in TER but also significant increase in the flux of the non-charged compound FITC-dextran 4 kDa. Using freeze–fracture electron microscopy and immunocytochemistry, they were able to attribute this increase in paracellular permeability to an altered distribution and membrane topology between neighbouring cells. Searching for the proteins forming the structural backbone of the TJ strands, the Tsukita group re-examined the junctional fraction prepared from chicken liver and discovered the first members of the claudin family: two 22-kDa proteins, claudin-1 and claudin-2 (Furuse et al. 1998a). The claudins also have four transmembrane domains, but do not show any sequence similarity to occludin (Fig. 3b). So far, 24 members of the claudin family have been identified in different species. Claudins appear to be expressed in a tissue-specific manner; some claudins are expressed only in specific cell types, e.g. claudin-5 is expressed primarily by vascular endothelial cells or claudin-11 appears to be expressed solely in oligodendrocytes and Sertoli cells (Morita et al. 1999). Moreover, most cell types express more than two claudin isoforms conferring different size and charge selectivity qualities by the amino acid sequence of their extracellular loops, and the combination of those isoforms results in cell- or tissue-type specific barrier function by “heteropolymerisation” into the resulting TJ strands (see below). As demonstrated by immunogold electron microscopy, there is accumulating evidence now that the claudins do constitute the TJ strands as observed by freeze–fracture electron microscopy (Tsukita et al. 2001). Exogenous expression of claudins in fibroblasts devoid of endogenous TJs resulted in the formation of TJ strands. Summarizing existing data, there is clear evidence that the claudins constitute the backbone of TJ strands, while occludin, which itself cannot reconstitute such TJ strands, seems to play a permeability regulating role by incorporating itself into the claudin-based strands, a process, the mechanism of which however is not yet understood. The function(s) of occludin thus still remain to be elucidated. A third class of integral membrane proteins comprises members of the immunoglobulin superfamily (Fig. 3c), and can be subdivided into a group consisting of JAM proteins and a group consisting of CAR, CLMP, ESAM and JAM-4 (Ebnet 2008; Ebnet et al. 2004). To date, at least three JAM isoforms have been described, which are expressed differentially in epithelial and endothelial cells, but also in cells devoid of TJ strands like leukocytes (D’Atri and Citi 2002). Except for JAM-1, little is known about the role of these proteins in TJ assembly and function. JAM-1, formerly F11 receptor (Sobocka et al. 2000) (Fig. 3c), may be involved in immune cell transmigration or cell adhesion (Bazzoni et al. 2000) but has not been localized to the junction strands. A putative PDZ binding motif in the cytoplasmic domain of JAM-1 has been identified, which has been able to interact with PDZ domains of ZO-1, AF-6, PAR-3 and MUPP1 (D’Atri and Citi 2002; Itoh et al. 2001). Moreover, JAM-1 has been shown to interact with cingulin. Thus, even though JAM-1 is not part of the TJ strands, it may well be involved in the propagation of signal cascades resulting from homophilic and heterophilic adhesion. A role for JAM-1 in the complex process of adhesion and transmigration of monocytes through endothelial cells has been demonstrated (Martin-Padura et al. 1998). As another function for the JAM proteins, a role in the assembly of TJs and regulation of paracellular permeability could be deciphered by ectopic transfection experiments (Cohen et al. 2001). Interaction of JAM-1 with occludin, so far not determined whether direct or indirect in nature, has been shown (Liu et al. 2000). In addition to their prime function as a regulated permeability barrier in the paracellular pathway and as fence in the plane of the membrane, TJs play a pivotal role in organizing such diverse processes as morphogenesis, cell polarity, cell proliferation, and differentiation, which require the coordination of signals impinging on and emanating from the plasma membrane. Mounting evidence suggests that the cytosolic TJ plaque is one of the sites in which such signaling is coordinated (Ebnet 2008; Gonzalez-Mariscal et al. 2003; Schneeberger and Lynch 2004). Since identification in 1986 of zonula occludens (ZO)-1 as the first TJ-associated protein (Stevenson et al. 1986), almost 30 additional proteins have been described associated with the cytoplasmic aspect of TJs (Schneeberger and Lynch 2004). They can be grouped into two major categories: The first are the peripherally associated scaffolding proteins like ZO-1 (ZO-2, ZO-3, AF6, and cingulin) that appear to organize the transmembrane proteins and couple them to other cytoplasmic proteins and to actin microfilaments. The second are numerous “signaling” proteins (ZONAB, RhoA, RalA, and Raf-1) proposed to be involved in junction assembly, barrier regulation, gene transcription, and perhaps other, presently undefined pathways. One of the key functions of tight epithelia is the creation of a diffusion barrier by tight control of the transcellular and paracellular pathways. This is acomplished by asymmetrical distribution of transporters and channels for the transcellular route, and on the other side by regulation of diffusion through the paracellular space via integral TJ proteins (Turner 2006). Hereby, certain claudins participate in the formation of ion-selective pores: available data suggest that TJs on the one hand are permeable to small noncharged solutes up to a size of 0.43–0.45 nm in radius as shown by the use of the membrane-impermeant polyethylene glycol as a tracer, but investigations also showed that pores within the TJs are capable of discriminating between ion charge and size, which both are additionally dependent on concentration and pH (Schneeberger and Lynch 2004; van Bree et al. 1988). The two extracellular loops of occludin consist solely of uncharched amino acid side chains (Fig. 3a) represented mainly by an unusually high content of tyrosine and glycine (Furuse et al. 1993) so that a direct role for occludin in conferring charge selectivity is doubtful. However, occludin could increase electrical resistance by interaction with the extracellular domains of the differently charged residues of the different claudins (see below), since ablation of occludin is not without consequence despite the fact that the protein does not appear to be required for TJ strand formation. Occludin-null mice express a complex phenotype, which is, however, not manifested by structural or functional TJ abnormalities: in occludin −/− mice, TJs were not affected morphologically, and electrophysiological barrier function of intestinal epithelium was normal. However, histopathological abnormalities were detected in several tissues, i.e., chronic inflammation and hyperplasia of the gastric epithelium, calcification in the brain, testicular atrophy, the loss of cytoplasmic granules in striated duct cells of the salivary gland as well as the thinning of the compact bone, pointing to complex functions of the occludin protein (Saitou et al. 2000). The lack of charged amino acid residues within the extracellular loops of occludin segregates occludin from the candidates contributing directly to the formation of ion-selective pores. The different claudins whose extracellular loops span a wide range of pK i on the contrary appear to be excellent candidates to mediate ion selectivity in TJ permeability (Fig. 3b). Major insight into the distinct charge selectivity of the claudins came from the work of Furuse et al. (2001), who could relate the different levels of resistance between MDCK I cells (TER > 10,000 Ωcm2) and MDCK II cells (TER <200 Ωcm2) to a differential claudin isoform expression, while MDCK I cells express claudin-1 and -4 but not claudin-2, MDCK II cells additionally express claudin-2, which seems to mediate higher ion permeability by pore formation/inducing strand breaks. Notably, transfection of the tight MDCK I with claudin-2 cDNA resulted in 20-fold decline in TER but not in the number of TJ strands. A wide range of further transfection and mutagenesis experiments introducing or ablating different claudins has been performed to date, and been partially helpful to elucidate the conductance conferring properties of the resulting pores (Matter and Balda 2003b). These informative observations must however be viewed with some caution because transfection and site-directed mutagenesis may lead to more than a change in net charge as for example an altered molecular conformation, or altogether the introduction of an unusual claudin protein could lead to disturbance of strand organisation within native strands. By the construction of chimera, Colegio et al. (2003) were moreover able to attribute ion selectivity of the claudins to distinct stretches within the primary amino acid sequence of the extracellular loops leading to alterations in TER and charge selectivity in transfection experiments. Taken together, available data strongly suggest a key role for the extracellular loops of the diverse claudins in the formation of ion selective pores within the TJ strands. The role of occludin in TJs and a putative contribution to building up the TJ’s ion selectivity (the ion pores) is unclear; it has been demonstrated that overexpression of occludin in MDCK cells reduces ion permeability but in the same time was shown to increase the transepithelial flux of the uncharged compound mannitol (Balda et al. 1996). Further observations then implicated that occludin may be a target for receptor-initiated signalling involving the Rho family of GTPases, and that by an additional not-yet-understood mechanism, occludin phosphorylation may regulate TJ permeability independently of cytoskeletal activity (Hirase et al. 2001). Some indirect evidence for a role of occludin in strengthening barrier properties arose from heterologous expression studies: when expressed in L-fibroblasts that lack endogenous cadherin-based adherens junctions and ZO-1, little adhesiveness was measured (Kubota et al. 1999). However, when overexpressed in fibroblasts, which do have well developed ZO-1-containing adherens-like junctions (NRK-fibroblasts), increased Ca2+-independent adhesion was observed, indicating that when interacting with ZO-1, occludin mediates adhesive functions (Van Itallie and Anderson 1997). Addition of neutralizing peptides of the peptide sequence of the second extracellular loop elicited competitive interference with cell–cell-adhesion in a dose dependent manner, implicating that this loop directly participates in adhesive interaction (Wong and Gumbiner 1997). Relating epithelial malignancy to the loss of cell–cell-adhesion, it was demonstrated that overexpression of oncogenic Raf 1 in rat salivary gland epithelial cells (Pa4–Raf1) disrupts TJs and induces an oncogenic phenotype by downregulating the expression of occludin (Wang et al. 2005). Raf1-mediated transformation of Pa4–Raf1 cells was subsequently shown to induce transcriptional downregulation of occludin and forced re-expression of occludin rescued the polarized phenotype of epithelial cells (Wang et al. 2007). Interestingly, forced expression of an occludin mutant lacking the second extracellular loop did not rescue the epithelial phenotype in vitro nor did it prevent tumor growth in vivo. These results demonstrate that the TJ protein occludin has a potent inhibitory effect on the Raf1-mediated tumorigenesis, and the second loop of occludin appears to be required for suppression of Raf1-induced tumor growth, potentially by mediating cell–cell-adhesion as presented above contributing to contact inhibition of cell division. Many cytokines have been shown to influence epithelial and endothelial TJ function and the actin cytoskeleton both in vivo and in vitro. To name the most prominent, the interleukins IL-0, IL-1, IL-3, IL-4, as well as tumor necrosis factor alpha (TNFα) and interferon gamma (IFNγ) could be demonstrated to influence TJ barrier function in epithelia and endothelia (Ahdieh et al. 2001; Oshima et al. 2001; Youakim and Ahdieh 1999). This review will emphasise the influence of a few selected cytokines on TJ structure/function and its adjoining actin cytoskeleton in diseases like inflammatory bowel disease and inflammatory disease of the CNS (Table 1). Crohn’s disease ranks among the chronic inflammatory bowel diseases (IBD) with diarrhoea as a leading symptom. This is chiefly attributed to epithelial barrier dysfunction, leading to an increased loss of solutes in the form of “leak-flux diarrhoea”. Notably, the integrity of the intestinal barrier is not only impaired in patients with Crohn’s disease but also many first-degree relatives of Crohn’s disease patients present with increased intestinal permeability in the absence of clinical symptoms (Hollander 1993; Peeters et al. 1997; Yacyshyn and Meddings 1995). From this observation it was concluded that barrier dysfunction in Crohn’s disease precedes the inflammatory process in contrast to many other inflammatory diseases, probably arising from genetic defects or driven by environmental factors like intestinal luminal antigens or bacterial toxins. The epithelial barrier in the intestine is established by a single layer of epithelial cells. However, barrier dysfunction alone does not to seem be sufficient to cause Crohn’s disease, since unaffected relatives of patients with Crohn’s disease comparably present increased permeability, but do not show the abnormal mucosal inflammatory response reported of patients with Crohn’s disease (Weber and Turner 2007). In healthy individuals, the intestinal mucosal barrier is organised through tight junction strands connecting the adjacent epithelial cells (Weber and Turner 2007). These TJs seal the paracellular space and an intact intestinal mucosa. TJ permeability is rate limiting for epithelial permeability and defects thereof are an established source for intestinal barrier defects as observed in Crohn’s disease. The basic understanding of TJ function we developed is that they form an ion-selective and size-selective paracellular gate whose permeability varies throughout the gastrointestinal tract (see above). According to this, it is not surprising that the pattern of claudin isoforms expressed varies alongside the gastrointestinal tract (Nusrat et al. 2000). Recent studies now show that the expression pattern of characteristic claudins is altered in Crohn’s disease (Weber and Turner 2007) with a concomitant effect on the integrity of TJ strands: Zeissig et al. 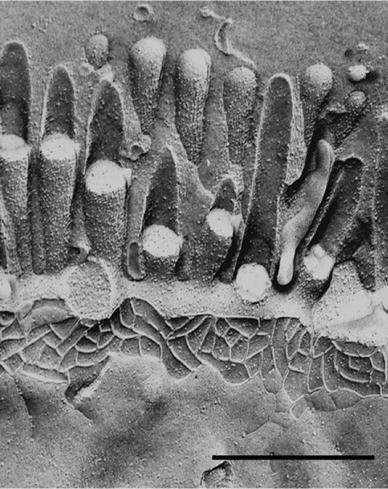 (2007) showed by freeze–fracture electron microscopy that the overall number of TJ strands sealing the epithelial layer is reduced while concomitantly an increased number of strand breaks was noted in tissue from patiens with Crohn’s disease (Zeissig et al. 2007). The expression of 12 claudin isoforms in the intestinal epithelium was investigated in healthy individuals and patients with Crohn’s disease, leading to the insight that the expression of the claudins-3, -5, and -8 was decreased in active disease. On the contrary, expression of barrier-reducing claudin-2 was increased in histological samples from patients, which was particularly observed in the crypt epithelium. This altered pattern of claudin isoform expression was thus concluded to be partly responsible for the observed mophological and functional disruption of TJs. However, claudin isoform expression patterns were unaltered in patients with inactive Crohn’s disease, rendering this observed change in expression patterns rather a consequence than a cause of active disease. It is has been acknowledged for a long time that chronic inflammation in Crohn’s disease is associated with the overproduction of proinflammatory cytokines. Searching for the nature of these pro-inflammatory mediators effecting the TJ disruption and dysfunction, investigators (Conyers et al. 1990; Heller et al. 2005; Prasad et al. 2005) had identified IL-13, IFNγ and TNFα as factors in patient’s serum lowering resistance and opening TJs. However, differential effects of the different cytokines crititical to IBD pathogenis have been reported from studies in cell culture models, indicating that the mechanisms by which IFNγ and TNFα inrease paracelluar permeability differ from those used by IL-13 (Prasad et al. 2005). IFNγ and TNFα exposure of model cell lines led to a reduction in claudin-2 expression, while IL-13 exposure induced increased claudin-2 expression. Those observed discrepancies, which might be based on the source of epithelial cell lines, the experimental design or the doses of cytokines applied are the focus of current investigation. Other lines of research are concentrated on gaining more information on the source of pro-inflammatory cytokines in IBD and the mode how those cytokines may work together to modify claudin expression pattern, either in vitro or in vivo (Weber and Turner 2007). At the cell biological level, recent investigation demonstrated that IFNγ exposure promoted the endocytosis of occludin, JAM-1 and claudin-1 into early and recycling endosomes (Bruewer et al. 2005), an effect which appears to be mediated by RhoA/Rho kinase, which further induced a myosin II-dependent formation of vacuoles in the apical cell moiety (Utech et al. 2005). At the gene expression level, other research groups could demonstrate that TNFα induced an increase in Caco-2 TJ permeability mediated by activation of the pro-inflammatory transcription factor NFκB. NFκB action leads to a downregulation of specifically ZO-1 gene expression and a redistribution of ZO-1 protein away from the intercellular junctions (Ma et al. 2004). A comparable effect could be described in the nonintestinal model epithelial cell line, MDCK, and in the blood brain barrier model cell line cEND, where also disruption of TJs following exposure of epithelial and endothelial cells to TNFα could be demonstrated (Förster et al. 2007; Poritz et al. 2004). Homeostasis of the central nervous system (CNS) microenvironment is essential for its normal function. It is maintained by the blood-brain barrier (BBB) which regulates the transport of molecules from blood into brain and backwards. The function of this highly specialised barrier is to (1) protect the brain from blood-borne substances and (2) to provide nutrient supply to the brain parenchyme by specialised transport systems (Rubin and Staddon 1999). The main structures responsible for this barrier property are the TJ. TJ are strongly developed in endothelial cells of the BBB but only moderately formed between endothelial cells of the peripheral vasculature: leaky blood vessels in the body allow many molecules to cross through to tissue, but the tight construction of the vessels in the CNS guards against brain entry, leading to high electrical resistance in the range of 1,500—2,000 Ωcm2, depending on the species investigated. In BBB-forming brain capillary endothelial cells (BCECs) the TJ proteins occludin and claudin-5, claudin-3, claudin-1 and claudin-12 were demonstrated by immunofluorescence and western blot analysis (Förster et al. 2007; Wolburg and Lippoldt 2002). Under physiological conditions, brain microvascular endothelial cells form a barrier limiting the extravasation of cells of the immune system like monocytes, lymphocytes and other leukocytes. It has been shown in this context that leukocytes can transmigrate to the BBB without net changes in vascular permeability and cell–cell contacts (Cramer 1992). However, increased leukocyte migration as in multiple sclerosis (MS) has been reported to lead to a re-organisation of the actin cytoskeleton and breakdown of the TJ proteins occludin and ZO-1 (Couraud 1998; Förster et al. 2007). MS is characterised as a chronic and progressive CNS disease with a remitting-relapsing profile. In the course of the disease, both demyelination and microvascular inflammation have been described as central pathophysiological insults. From an animal model for MS, experimental allergic encephalomyelitis (EAE) (Korner and Sedgwick 1996), the inflammatory cytokines TNFα and IL-1 have been delineated to be the key mediators inducing alterations in BBB permeability. Clinically matching data have been collected from MS patients, who show an elevation in TNFα and/or IL-1 in cerebrospinal fluid (CSF) (Weber and Rieckmann 1995). Cytokine-promoted opening of the BBB has been shown to occur due to degradation and decreased synthesis of TJ proteins (Chang and Werb 2001; Harkness et al. 2000; Silwedel and Förster 2006; Yang et al. 2006), resulting in compromised junctional integrity. Particularly, the TJ proteins occludin and ZO-1 have been shown to be negatively affected by the presence of these pro-inflammatory cytokines. Searching for the mechanism of TJ protein degradation, consecutive studies showed, that in many neuroinflammatory conditions, including MS, the matrix metalloproteinases (MMP) play an important role in disrupting the BBB. Amongst these, it has been demonstrated that selectively, MMP-9 (gelatinase B) is increased in CSF levels in MS patients. Tissue inhibitors of metalloproteinases (TIMPs) form complexes with either activated MMPs or with their pro-forms after their secretion, thus regulating MMP activity under physiological conditions (Brew et al. 2000; Yong et al. 2001). Levels of TIMP-1 are however reduced in MS patients relative to control patients, suggesting an imbalance in MMP-9/TIMP-1 ratios in MS (Avolio et al. 2005). MMP-9-mediated opening of the BBB then allows amplification of the inflammation, as demonstrated by radioisotopes (Kermode et al. 1990). Looking for therapeutical agents restoring the unbalaced MMP-9/TIMP-1 ratios in MS, Förster et al. (2007) showed that glucocorticoid treatment reduces the levels of MMP-9 markedly in a cell culture model of the BBB, an effect which was shown to be based on glucocorticoid-mediated transcriptional activation of the TIMP-1 gene. This study further demonstrated that the administration of the glucocorticoids dexamethasone and hydrocortisone preserved the functional integrity of the TJs and adherens junctions under pro-inflammatory conditions, chiefly by maintaining the levels of the TJ components occludin, claudin-1, claudin-12, ZO-1 and VE-cadherin, while dexamethasone effects on claudin-5 were negligible (Blecharz et al. 2008; Förster et al. 2007). Another study demonstrated differential susceptibility of cerebral and cerebellar endothelial cell lines to BBB breakdown in response to inflammatory stimuli (Silwedel and Förster 2006): increased fragility of the cerebellar BBB had been reported, as the typical caudal to rostral lesion development of MS and EAE with a preference of the cerebellum indicates (Cross et al. 1993; Juhler et al. 1984; Namer et al. 1993). Matching those studies, the authors could demonstrate a faster and more pronounced increase in permeability in the cerebellar BBB manifested by reduced TER and reduced TJ protein expression using the cerebellar BBB model cell line cerebEND (Silwedel and Förster 2006). The stronger effects of TNFα on endothelial cells of the cerebellum as compared the the cerebrum could be explained on the cellular level, where the TJ protein levels of claudin-5 and occludin were shown to be differently affected in cerebellar and cerebral microvascular endothelial cells: effects on occludin were more pronounced in cerebellar endothelial cells, while cerebral endothelial cells of the BBB showed a stronger decrease in claudin-5. Since it was shown that the main protein buiding up the barrier appears to be occludin, while claudin-5 protein, which is also well detectable in non-BBB endothelial cells, does not seem to influence barrier properties to the same extent (Foerster et al. 2002, 2005, 2006; Wolburg and Lippoldt 2002). One may speculate that the lower overall occludin contents of endothelial cells of the cerebellar BBB compared to the cerebral BBB can partly explain the greater sensitivity of the cerebellar BBB to inflammatory stimuli. The cochlea of the inner ear is divided into two compartments of different ionic composition. Hereby, the perilymph of the scala vestibuli and scala tympani is high in Na+ but low in K+ concentration, while the endolymph of the scala media resembles the intracellular ionic composition, being high in K+ but low in Na+ (Ferrary and Sterkers 1998). This ion gradient leads to the establishment of an 80–100 mV endocochlear potential, necessary for the depolarisation of sensory hair cells, enhancing the sensitivity of mechano-activated channels at the top of stereocilia (Hudspeth 1989). Besides, hereditary defects in the gap junction proteins connexin-26 and connexin-43 (Sabag et al. 2005) an association between tight junctions and hearing loss was established. The importance of claudin-14 expression in the cochlea was demonstrated by the identification of two different CLDN14 mutations that cause nonsyndromic recessive deafness DFNB29 in two large consanguineous Pakistani families (Wilcox et al. 2001). By in situ hybridization and immunofluorescence labeling mouse claudin-14 expression in the sensory epithelium of the organ of Corti was observed. By the generation and characterisation of claudin-14 knockout mice as a model for autosomal-recessive deafness DFNB29 it was revealed that deafness occurred due to death of outer hair cells. Searching for the factors that promoted increased death of outer hair cells, morphology of the TJs of claudin-14 knockout mice was evaluated. It was demonstrated that TJ strands between supporting cells and between outer hair cells and supporting cells in the organ of Corti are still present and appear morphologically normal in freeze fracture replicas. The analysed TJ strands which are composed of multiple claudins were thus concluded to have rather a functional than an ultrastructural defect (Ben-Yosef et al. 2003). Following the reasoning that claudins create charge-selective channels, Ben-Yosef characterised the electrophysiologic properties of claudin 14 by ectopically expressing it in MDCK cells, which revealed a strong discrimination of transfected monolayers against Na+ and K+ ions. Ben-Yosuf and coworkers thus concluded that the absence of claudin 14 from TJs in the organ of Corti might lead to elevated K+ concentration in the space of Nuel, which is normally filled with the K+-poor cortilymph and increased death of outer hair cells. Long-term exposure of the basolateral membranes of outer hair cells to high K+ concentrations had been shown to be toxic and eventually to lead to cell death before (Zenner 1986). By the identification of two claudin-14 missense mutations that were unable to form TJs after ectopic expression of CLDN14 in L mouse fibroblastes, Wattenhofer et al. (2005) were then able to prove that the basis for the development of deafness is incorrect recruitment and TJ strand formation in cells expressing mutated CLDN14. Inherited and acquired defects in epithelial membrane transport are responsible for many human diseases. In the kidney, tubular claudins play a role in extracellular or paracellular permeability. In this context, it has been shown that mutations in claudin-16 (Paracellin-1) impair the function of TJs in the paracellular resorption of Mg2+ and Ca2+ but not of monovalent cations (Simon et al. 1999), probably founding the molecular basis for the development of familial hypomagnesemia with hypercalciuria and nephrocalcinosis (FHHNC), an autosomal recessive renal tubular disorder. In FHHNC patients, the impaired tubular reabsorption of Mg2+ and Ca2+ in the thick ascending limb of the loop of Henle with an eventual progression can lead to end-stage renal disease (Lee et al. 2006). Functional tubular reabsorbtion mechanisms are vitally important, since a normal adult absorbs only 200 mg Ca2+ from the diet each day, but loses 8,000 mg to filtration across the glomerulus. To achieve normal calcium balance, the majority of the filtered load must be reabsorbed by the tubule, to approximately 90%, or 7,000 mg/day and this occurs mainly via the paracellular pathway driven by a lumen positive potential across the tubular wall. The structural backbone of the paracellular pathway must provide for the significant substrate selectivity and functional heterogeneity between nephron segments and thus also plays a pathophysiologic role in renal diseases. Clinically, the symptoms and gradual kidney damage caused by FHHNC cannot be alleviated by intravenous or oral supplementation with Mg2+, and kidney transplantation is often the only option at later stages of the disease. Recent studies (Simon et al. 1999) have reported that FHHNC is caused by mutations in a gene, which encodes the TJ protein, paracellin-1. Paracellin-1 (PLCN-1) belongs to the claudin family (claudin-16) that allows the paracellular transport of Mg2+ and Ca2+. As a member of the claudin family of TJ proteins claudin-16 exhibits four transmembrane spans with two extracellular loops and both termini located in the cytoplasm. To date, more than 20 distinct mutations have been identified, which affect either the trafficking of PLCN-1/claudin-16, or its permeability properties (Kausalya et al. 2006). Interestingly, FHHNC patients do not exhibit the salt wasting or metabolic alkalosis that is found in Bartter’s syndrome (Wong and Goodenough 1999). Based on these findings, it is tempting to hypothesize that PCLN-1 might form a Mg2+- and Ca2+ -conducting pore. It is therefore likely that PCLN-1 selectively mediates the barrier to divalent but not monovalent cations. Thus, not only can the paracellular barrier discriminate between charged and uncharged solutes, but it may also exhibit an even higher level of specificity distinguishing charge and ionic radius and size of the hydrate shell. As to molecular investigations based on the use of diverse cell culture models for kidney epithelial cells, there is some discrepancy between results obtained upon overexpression of PLCN-1 in two different kidney epithelial cell lines used. In the canine MDCK cell line, another group found PCLN-1 to decrease Na+ permeability, to decrease TER and to enhance transepithelial Mg2+ transport (Ikari et al. 2006). Another recent study performed in the porcine proximal tubule LLC-PK1 cells suggests that paracellin-1 functions to modulate paracellular conductance and not transcellular transport. They hypothesise that PLCN-1 mediates mostly paracellular Na+ permeation to build up the positive lumen potential and that this lumen-positive potential would be the driving force for the reabsorption of Mg2+ (Hou et al. 2005). As described for other molecules relevant to Mg2+ homeostasis such as ACDP2, (ancient conserved domain protein), a divalent metal transporter, or the Mg2+ transporter MagT1 (Wong and Goodenough 1999), the human PLCN-1 promoter appears to be responsive to external Mg2+ concentrations, since the renal epithelial cell specific PLCN-1 gene expression was shown to positively correlate with the amount of Mg2+ offered in the growth medium (Efrati et al. 2005). Further, mutations in PLCN-1 can affect claudin-16 protein targeting at the TJs (Kausalya et al. 2006). The mutation T233R for example prevents interaction of claudin-16 with ZO-1 and results in lysosomal targeting of claudin-16 instead. Protein kinase A (PKA) mediates phosphorylation of claudin-16 at Ser217, failure of which equally leads to dissociation of claudin-16 from ZO-1 and its translocation into the lysosomes (Ikari et al. 2006). In conclusion, although the mechanism of PLCN-1/claudin-16-mediated Mg2+ and Ca2+ reabsorbtion is not yet fully understood, it is clear that these claudins play a crucial role in this process. Recently, Konrad et al. (2006) additionally unravelled a role for claudin-19 in the development of FHHNC. They had clinically characterized one Swiss and eight Spanish/Hispanic families affected with severe hypomagnesemia due to renal wasting, nephrocalcinosis, and progressive renal failure but had to recognize that the individuals did not have any mutations in CLDN16. They showed that the renal phenotype of the affected patients was virtually undistinguishable from that of patients who presented with FHHNC with proven CLDN16 mutations. However, the affected individuals in these families also have severe visual impairment, characterized by macular colobomata, significant myopia, and horizontal nystagmus (Konrad et al. 2006). Konrad et al. were able to map a new locus for recessive renal magnesium loss on chromosome 1p34.2 and identified mutations in CLDN19, yet another member of the claudin family in patients affected with FHHNC and additionally, with severe ocular abnormalities. CLDN19, which encodes the tight-junction protein claudin-19 was demonstrated to be highy expressed in renal tubules and the retina. In an effort to understand the mechanisms underlying the roles of the two claudins in mediating paracellular ion reabsorption in the kidney, Goodenough and co workers (Hou et al. 2008) showed using pig kidney epithelial cells, that CLDN19 functioned as a Cl(−) blocker, whereas CLDN16 functioned as a Na(+) channel. Mutant forms of CLDN19 were shown to be associated with FHHNC since they were unable to block Cl(−) permeation. Coexpression experiments further elucidated that CLDN16 interacts with CLDN19 and that their association confers cation selectivity, suggesting a role for mutant forms of CLDN16 and CLDN19 in the development of FHHNC. The barrier between the vascular lumen and neural layers in the retina and the brain parenchyme maintains a characteristic microenvironment and is essential for proper neuronal function. This blood-retinal barrier (BRB) consists of two anatomical entities: an inner BRB formed by junctions between endothelial cells of the retinal capillaries, and an outer BRB composed of TJs between retinal pigment epithelial cells. Clinical evidence from fluorescein angiography has demonstrated that the inner BRB appears to be the primary site of vascular leakage leading to macular edema. The BRB is built up and maintained by TJ complexes that make up the blood vessels of the microvasculature (Mitic and Anderson 1998). The principal proteins found in the retinal endothelial TJs are occludin and claudin-5 (Dejana et al. 2001). Loss of the BRB integrity and vascular permeability leading to macular edema (Vitale et al. 1995) characterise diabetic retinopathy. Macular edema in turn is thought to be directly responsible for vision loss in diabetic retinopathy (Felinski and Antonetti 2005). Vascular endothelial growth factor (VEGF) is thought to be chiefly responsible for this increase in BRB permeability, albeit other permeabilizing factors like histamin or the cytokines IL-1 and TNFα have also been implicated (Felinski and Antonetti 2005). Levels of VEGF, originally identified as an angiongenic factor serving as a mitogen for vascular endothelial cells have been recently correlated with increased vascular permeability (Felinski and Antonetti 2005), compatible with increased VEGF levels detected in the vitreous of diabetic patients for decades. There is enough evidence to show that diabetes and VEGF induce retinal vascular permeability by altering TJ complexes, evidenced for instance by the decrease in occludin content in the retinas of diabetic rats (Felinski and Antonetti 2005). In cultured primary bovine retinal endothelial cells, this observation was mirrored by the observation of decreased occludin contents after VEGF administration (Antonetti et al. 1998). Follow-up investigation underlined this and showed down-regulation of occludin in retinal endothelial cells in culture after VEGF stimulation. VEGF further activates PKC, which leads to increased occludin and ZO-1 phosphorylation (Harhaj et al. 2006). Phosphorylation of occludin and ZO-1 likely contribute to dysregulated endothelial paracellular permeability (Abbott et al. 2006). Regulation of PKC activity and TJ protein modifications may thus have therapeutic implications for treatment of diabetic retinopathy. Recent investigation has further revealed that alterations of the BRB may involve the active proteolytic breakdown of the endothelial cell TJs by MMPs as also evidenced in the case of MS (compare above) (Leppert et al. 2001). Specifically, elevated levels of MMP-9 have been seen when retinal endothelial cells were exposed to high glucose conditions as a cell culture model of diabetes, leading to proteloytic degradation of specifically the TJ protein occludin followed by disruption of the overall TJ complex (Giebel et al. 2005), rendering the regulation of MMP secretion and activity another therapeutical target in diabetic retinopathy. Changes in TJ function have been shown to be an early and key aspect in cancer metastasis (Ehler et al. 2001). Recent studies showed a role for claudin-1 in invasion and metastasis in mammary glandular differentiation (Förster et al. 2002) and carcinogenesis (Morohashi et al. 2007). Interestingly, there is an absence or significant loss of claudin-1 expression in several established breast cancer cell lines. Claudin-1 expression in primary human mammary epithelial cells, in contrast to low or undetectable levels of expression in a number of breast tumors and breast cancer cell lines, points to claudin-1 as a possible tumor-suppressor gene. In sections from surgically resected breast specimens, a significant loss of claudin-1 protein in breast cancer cells could be shown by immunohistochemistry (Tokes et al. 2005). This finding suggests that claudin-1 may play a role in invasion and metastasis. The expression profile of claudin-1 in non-malignant versus tumor-derived cells has made this gene an interesting candidate for involvement in tumorigenesis, namely by acting as a suppressor of mammary epithelial proliferation. In order to evaluate the CLDN-1 gene in sporadic and hereditary breast cancer, Krämer et al. (2000) characterized its genomic organization and screened the four coding exons for somatic mutations in 96 sporadic breast carcinomas and for germline mutations in 93 breast cancer patients with a strong family history of breast cancer. In addition, they compared the 5′-upstream sequences of the human and murine CLDN1 genes to identify putative promoter sequences involved in down-regulation of the CLDN1 gene under malignant conditions and examined both the promoter and coding regions of the human gene in various breast cancer cell lines showing decreased claudin-1 expression. However, neither in sporadic or hereditary breast cancers, nor in breast cancer cell lines they found evidence for a role of aberrant claudin-1 in breast tumorigenesis and concluded that other regulatory or epigenetic factors could be involved in the down-regulation of the CLDN1 gene during breast cancer development. A correlation between TJ abnormalities and neoplasia can be supported by several observations: alterations in the number, appearance, and permeability of TJs have been demonstrated in various cancer types (Cochand-Priollet et al. 1998; Soler et al. 1999; Swift et al. 1983) and in pre-malignant mammary epithelial cells (Förster et al. 2002). At the molecular level, the Drosophila lethal(1) discs-large-1 gene (dlg) product, which localises to TJ-related insect septate junctions has been shown to regulate epithelial cell proliferation. Genetic loss of dlg leads to a neoplastic overgrowth phenotype (Woods and Bryant 1991). The loss of expression of claudin-1 itself has been demonstrated in several mammary carcinoma cell lines (Swisshelm et al. 1999). The expression of the TJ plaque protein ZO-1 has been shown to be reduced in breast carcinomas or breast cancer cells (Hoover et al. 1998). These findings support the hypothesis that claudin-1 might be involved in the development of breast cancer and possibly in other epithelial tumors too. The molecular pathways leading toward the loss of claudin-1 expression however, remain to be explained. Food poisoning by Clostridium perfringens enterotoxin (CPE) leads to diarrhea symptoms classified as “C. perfringens type A food poisoning and antibiotic-associated diarrhea”. The enterotoxin protein has been elucidated to intrude the cells by interacting with epithelial TJ, including certain claudins. Toxin-induced cytolytic pore-formation is a prerequisite for this and involves residues in the N-terminal half of CPE protein, while residues near the C-terminus are required for binding to claudins. 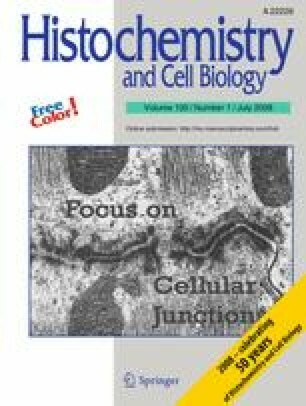 In detail, the single 35 kDa CPE polypeptide first causes cellular damage by altering plasma membrane permeability by the formation of an approximately 155 kDa CPE-containing pore complex necessary for the subsequent interaction with TJ proteins via its C-terminal receptor-binding region (McClane 2001). CPE was then perceived to affect TJ structure and function in a way that permeability properties of the epithelial layer are altered leading to diarrhea (McClane 2001). Further investigation has determined the isoforms of claudins targeted by CPE. Sonoda et al. (1999) were able to show that the COOH-terminal half fragment of CPE (C-CPE) bound effectively to claudin-3 and claudin-4 in MDCK I cells expressing the claudins-1, -2, -3 and -4. They were further able to show that in the presence of C-CPE, reconstituted TJ strands gradually disintegrated and disappeared from their cell surface in C3L cells. As a consequence, because diverse claudins are overexpressed on some human cancers, the toxin became interesting for targeting chemotherapy in the manner of a Trojan horse (Long et al. 2001; Michl et al. 2001). Recently, van Itallie et al. (2007) aimed to solve the structure of the CPE claudin-binding domain to advance its therapeutic applications. The structure was shown to be a nine-strand beta sandwich with previously unappreciated similarity to the receptor-binding domains of several other toxins of spore-forming bacteria, giving strong evidence for the presence of a common ancestor for several receptor-binding domains of bacterial toxins (Van Itallie et al. 2007). The very recent elucidation of the structure of a 14-kDa fragment containing residues 194 to the native COOH terminus at position 319 by X-ray diffraction to a resolution below 2 Å showed that the structure is a nine-strand β sandwich with previously unappreciated similarity to the receptor-binding domains of several other toxins of spore-forming bacteria, i.e., the collagen-binding domain of ColG from Clostridium histolyticum and the large Cry family of toxins (including Cry4Ba) of Bacillus thuringiensis (Van Itallie et al. 2008). The authors speculate that the claudin-4 binding site is on a large surface loop between strands β8 and β9 or includes both of these strands. They further were able to clarify that the sequence crystallized binds to purified human claudin-4 with a 1:1 stoichiometry. The binding affinity was determined to be in the submicromolar range similar to that observed for binding of native toxin to cells (Van Itallie et al. 2008). These results could now provide a structural framework to advance therapeutic applications of the toxin. The discovery of the existence of occludin- and claudin-based TJs constituting a permeability barrier in epithelial and endothelial cells has paved the way for the elucidation of the molecular background of diverse human diseases the pathogenesis of which had been unclear before. It became clear that the presence of TJs is indispensable for tissue compartmentalisation and cellular homeostasis. Disturbances in TJ function are reflected in many diseases, but on the other hand, awareness of their involvement has facilitated therapy enormously. For instance, antiinflammatory or antimetastatic drugs could be developed based on their ability to repair broken barrier function. These strategies have become indispensable in the treatment of disease like MS, inflammatory bowel disease or diabetic retinopathy. Following the strategy of pathogenic agents, which use TJ proteins as a docking station to invade cells, even strategies for drug delivery techniques could be implemented. Future attempts will have to address the role of occludin and the exact contribution of the diverse claudins to the formation of ion selective pores, which are still open questions. A more thorough understanding will greatly facilitate diagnosis and the development of specific treatment regimens for diseases originating from impaired TJ function. This work was supported by grant SFB688/TPA5 from Deutsche Forschungsgemeinschaft DFG to CF. The author is especially thankful toDetlev Drenckhahn for constructive suggestions and critical reading of the manuscript. The author is grateful to Kinga Blecharz for editing expertise and Malgorzata Burek for efficient and pleasant help in collection of material.